I got a pretty good followup in my previous post with how to implement "Single-Pass Wireframe Rendering". I thought I'd take a second to briefly explain how the edge detection actually worked. As I said before, the basic idea is that we want each fragment to know about how far it is from any given edge so we can color it appropriately. First, we have to remember that OpenGL is an interpolation engine and it is very good at that. 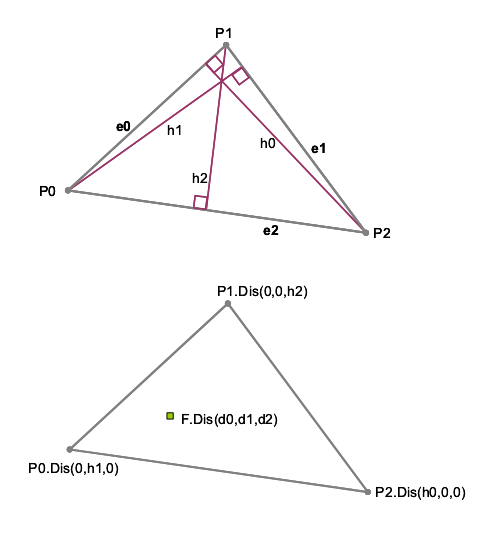 When some attribute is assigned to a vertex and the triangle is rasterized, fragments created inside that triangle get some interpolated value of that attribute depending on how far it is from the surrounding vertices. 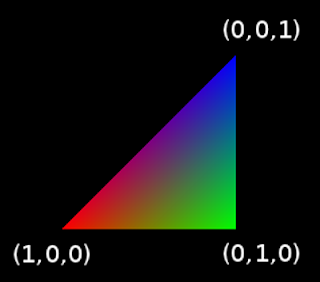 Shown below, a triangle has a three-channel attribute assigned to each vertex. In the fragment shader, those values will be some mixture of the three channels. You'll notice, for example that the triangle in the image below gets less red from left to right. The first RGB channel starts at 1, but as one moves towards that channel goes to zero. 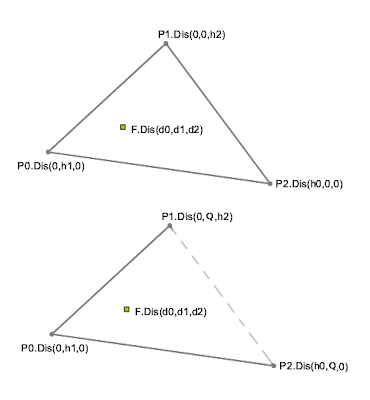 That's the basic gist of the attribute interpolation. The nice thing about modern GPUs is it lets us put anything we want in these attributes. They may be used in the fragment shader as colors, normals, texture coordinates, etc. but OpenGL doesn't really care about how you plan on using these attributes as they all get interpolated the same way. In the fragment shader, we can decide how to make sense of the interpolated values. Notice the pixel values along the top-left area of the triangle above have a low green value because the left and top vertices have no green in them, so pixels moving towards that edge have less and less green. Similarly, the right side of the triangle has pretty much no red in it, because the values in the vertices above and below it have no red. The same holds true for the bottom edge of the triangle having no blue. The insight to be gained here and which is used in "Single-Pass Wireframe Rendering" is that values along the edges of the triangle will have a very low value in at least one of the three channels. If ANY of the channels is close to zero, that fragment is sitting on or very near an edge. We could just assign similar values as here and just render edges if the value is below some threshold. The problem, though, is that these values aren't in viewport space and we probably want to measure our line thickness in terms of pixels. Otherwise the edge thickness on our screen would change depending on the size of the triangle (maybe you want that, whatever). As shown in the picture above, we calculate the altitudes of each vertex in screen space and store them in some vertex attribute. In the fragment shader, the value (d0,d1,d2) will be somewhere between the three vertex attributes. As described above, if any of these channels d0, d1 or d2 is close to zero, that means we're sitting on an edge. nVidia has an excellent paper called Solid Wireframe, which goes into a bit more detail how this works and provides some really great illustrations. 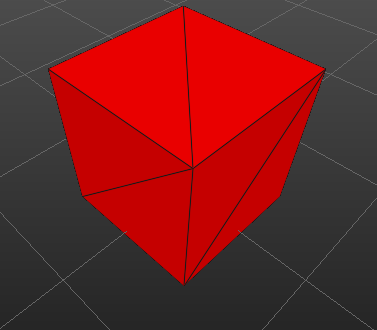 While rendering edges is nice, I may not want every edge of a given triangle to be rendered. For example, if I have some five-sided polygon concave polygon that I break into triangles using some technique like ear clipping (pdf), I may not want the interior edges inside the polygon to be rendered. 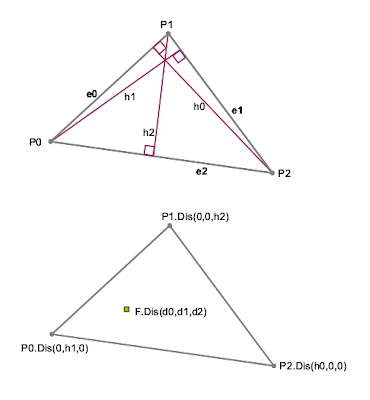 A simple way to exclude an edge of a given polygon is to make sure that that value never goes to zero by setting the channels of the other vertices to some high amount Q. This Q can be any value higher than your maximum edge-width. In my program, I set it to 100 since I'll probably never be drawing edges thicker than that. Designating which edges to exclude requires an additional vertex attribute sent down from the program. 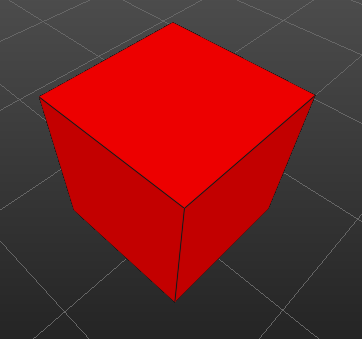 I attach a float to each vertex with a 0 or 1 whether or not I want to exclude that edge from being rendered. I then update my geometry shader accordingly. I'm finally starting to make some noticeable headway in my Sunshine app. It feels like everything I do has such a little impact on the UI, but then I tell myself it's all "infrastructure" and soon I'll be able to start adding features like crazy. I'm probably lying to myself. 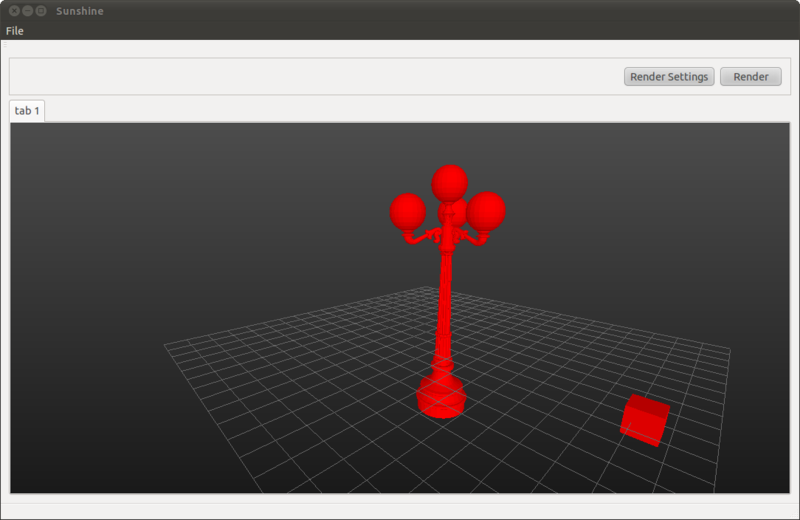 After a lot of help from the boost::python mailing list, I've managed to expose my Scene object to python. Although there isn't a lot of the C++ code exposed, the "infrastructure" for it is there so I can expose classes and individual functions quickly on a need-to-expose basis. Right now I have a python script, which compiles to a Qt resource in the binary and use it to import OBJs. Although it's fairly generic (lacks material support, ignores normals/UVs), it would be plenty trivial to import other geometry types with very little effort. As I mentioned, I'm ignoring the normals provided in the lamp OBJ for now and recompute the normals per face (no smoothing). I've had a bug in the fragment shader for the longest time that I've ignored until I started moving the cube mesh away from the origin. Looking at the GLSL, it looks like I was transforming my incoming normal by my object-to-world. That made the translation factor muck up the vector. 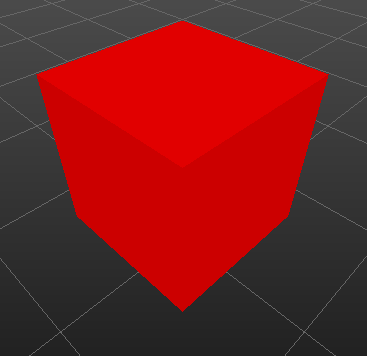 I ended up adding a normal object-to-world matrix that right now just consists of the model rotation matrix. It looks a lot better! I ended up trying several different libraries to embed python into my app. PythonQt seemed like a good candidate as I was writing my app using the Qt libraries, but I encountered a few strange bugs and the community seemed to be stagnating--unfortunate as the API seemed really intuitive. Both SIP and SWIG are popular for binding, but both require a special syntax in external files, and I wanted to modify my qmake build as little as possible and didn't want to learn a new syntax. After finally experimenting with boost::python, I found the library allowed me to write my mappings inside C++ without learning any new syntax or much with my build system. I had a Scene class, which naturally handles everything in my scene, which I wanted to expose to python. boost::python has a special function called BOOST_PYTHON_MODULE, which puts a class into a particular module, which is imported into python. Once wrapping my Scene class with the class_ function, I could then import the Scene class into python from the "scene" module. The boost::noncopyable is an optional argument that notes not to pass the Scene object to python by value, since my scene might be rather large in memory and I didn't want multiple copies. This is more of a compiler rule as I still have to make sure I'm not passing the scene by value, but with that I get a compiler error if I try. I have also been trying to use smart pointers for heap-allocated objects. I started out using QSharedPointer, but boost::shared_ptr is already supported by boost, so I ended up switching my smart pointers over to boost's. Once that is setup, I could then pass my Scene object over to python. I immediately hit a snag. In particular to my Scene class, the Scene actually contained my python engine and called the python code. Although I created the scene in a smart pointer outside the class, I didn't have access to that smart pointer inside member functions to pass to python unless I passed it into the function, which seemed unnecessary to pass a Scene member function a smart pointer to itself. I couldn't use "this" inside the member function as boost::python wouldn't know by default how to keep that in memory since other boost pointers were already pointing to my Scene object. I couldn't just create a shared_ptr in the function either, because I didn't want my Scene deleted when the shared pointer goes out of scope when the function returns. I was actually getting this error because boost didn't know how to deal with the this pointer without passing it by value (which I explicitly said I didn't want copied, right?). It turns out boost::python has a special way to do deal with this situation using a special class called boost::enable_shared_from_this, which my Scene class can inherit from. boost::enable_shared_from_this provides two functions that allow the Scene object to create shared pointers inside member functions by calling shared_from_this(), which is inherited from boost::enable_shared_from_this. // pass the python function a shared pointer instead of "this"
After updating the member function, the error went away and I could then send my Scene object to python inside and outside of the member function. Python now has access to my scene object and I can start exposing some more functions and variables inside my Scene class. Below is a short working example of sending a shared pointer to python inside and outside of a member function (or you can look here). Special thanks to the boost::python mailing list, which was very helpful in getting me going. To compile the code, I used python-config to get the includes and flags. python-config is a simple utility that queries the path of your python headers and libs depending on which version of python is installed and designated on you system. It's a useful utility as I usually have several versions of python on my machine at a time. It's especially nice not having to hard code your application's build system to a particular version of python.